poets and Edo period painters. The Wakanoura tidal flats can be seen beyond the stonework of Furo-bashi Bridge. The shape of the underlying land is revealed gradually as the tide goes out. Court poet Yamabe no Akahito, who accompanied Emperor Shomu on his imperial visit to Wakanoura in 724, provided vivid descriptions of the natural landscapes infused with the energy of the ebb and flow of the tide in praise of the awe-inspiring beauty of Wakanoura and Tamatsushima. With those words, Wakanoura became a sacred place. The god of waka poetry is enshrined on Tamatsushima, which became a place of wonder to waka poets, who described it in many of their works. Edo period painter Kuwayama Gyokushu combined scenes described in the Man’yoshu and Shin Kokin Wakashu anthologies of poetry with the actual landscapes of the area and in the process captured the elegance of both with remarkable success. Those landscapes are known as the Ten Views of Wakanoura, and they include depictions of cranes taking flight near the reedy shore of Wakanoura’s tidal flats as described by Yamabe no Akahito, of Mt. Nagusa behind Kimii-dera Temple as seen against the setting sun over the tidal flats at high tide, and of fishing boats appearing and disappearing between pine forests in a view of the tidal flats from Mt. 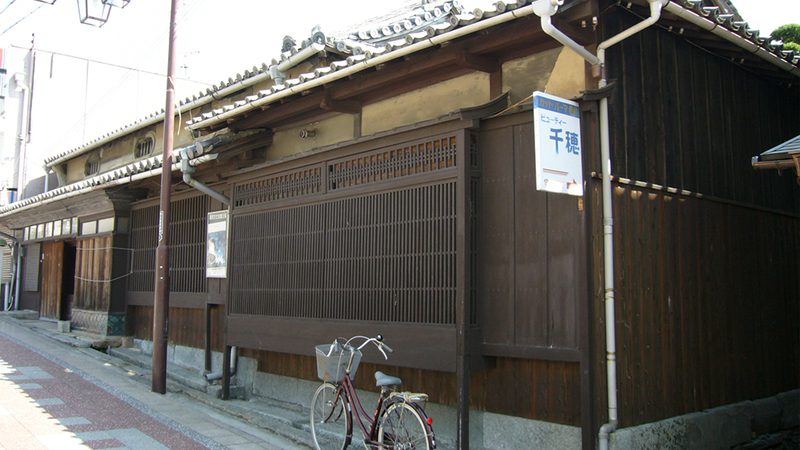 Tenjin, where Wakaura Tenman-gu Shrine is located. There’s also a depiction of Wakanoura as seen through the autumn-tinged leaves of Fujishiro-zaka Slope, where Prince Arima drew his last breath. The tidal flats at high tide. Lined with pine trees, the Kataonami sand spit can be seen extending toward the opposite shore. The place name Kataonami derives from a poem by Yamabe no Akahito. If you climb Mt. 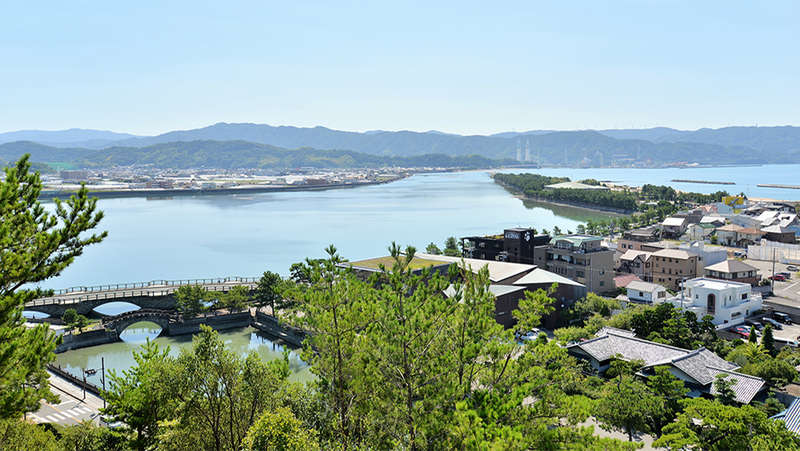 Tengu, you can enjoy panoramic views of the majestic landscape of the area’s tidal flats and the sand spit known as Kataonami. Getting there: Located in the immediate vicinity of the Furobashi bus stop. Cost, hours, and days closed: The surrounding area is open to the general public. 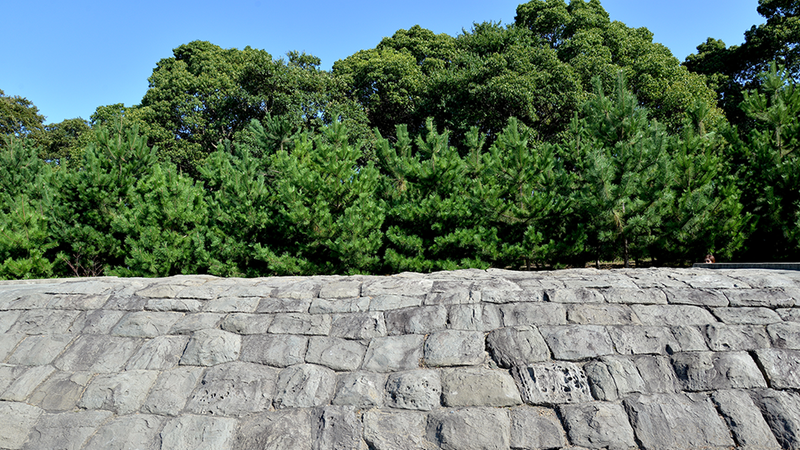 Left: It is said that Emperor Shomu loved to gaze down upon the landscape of Wakanoura from the top of Mt. Tengu, which is located behind the shrine. Right: The paintings of Thirty-six Waka Poets depicts waka poets such as Kakinomoto no Hitomaro (upper photo) and Yamabe no Akahito along with their works of poetry. The actual works are on loan to the Wakayama City museum. Tamatsushima-jinja shrine enshrines Wakahirume no Mikoto, the sister of Amaterasu Omikami, and Sotoorihime no Mikoto, the god of waka poetry. Yorinobu, the first lord of the Kishu domain, donated 36 portraits of waka poets, known as the Thirty-six Waka Poets, to the shrine. Replicas of the works can be seen in the main hall. 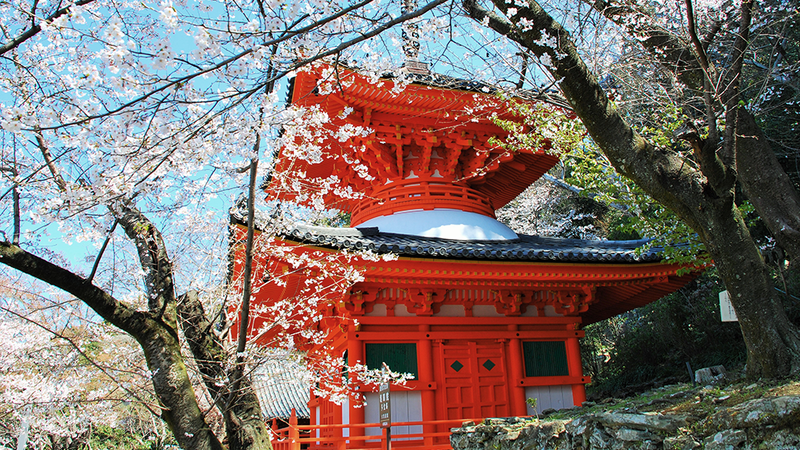 Cost, hours, and days closed: The shrine’s grounds are open to the general public. Located in a cavern on the southern face of Mt. Kagami, this shrine was known as Koshi-no-Iwaya. Its grounds are home to a shrine and a small hall of worship, and pilgrims consider it to enshrine gods of safe childbirth and conception. Ten Views of Meikoura, by Okamoto Rokuson and dating to the late Edo period to early Meiji period. Clockwise from the top right are shown Shokanchotei, Fujishirorakuyo, Roshumeikaku, and Nagusabancho. 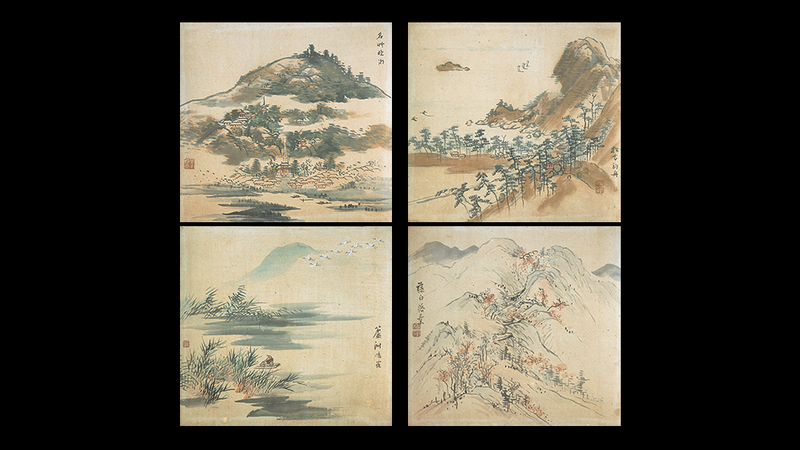 This collection of paintings depicts 10 famous views in and around Wakanoura (Meikoura). Executed by Kuwayama Gyokushu, an Edo period painter from Wakanoura, the works express the scenery described waka poems using actual landscapes, and they inspired numerous other paintings and artistic crafts. Okamoto Rokuson created his own unique arrangement of the same landscapes. A two-story gate stands halfway up Mt. Tenjin. If you climb the stone stairs, you’ll be rewarded with sweeping views of Wakaura Bay. 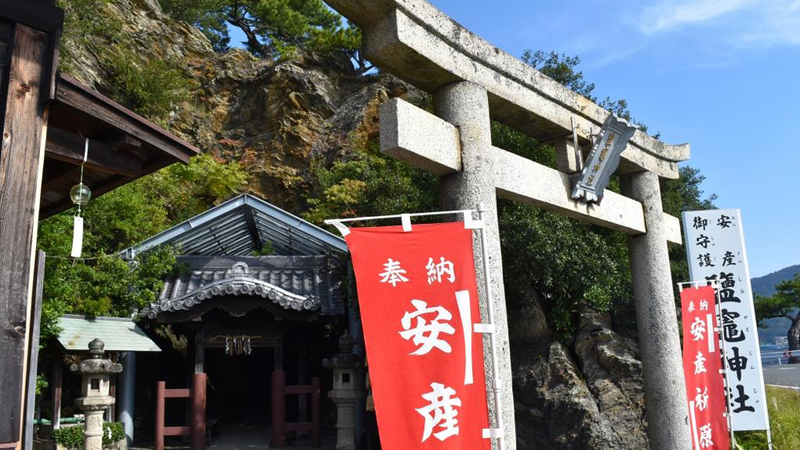 Lore holds that this shrine enshrines Sugawara no Michizane, who is said to have visited Wakanoura on his way to Dazaifu. The main hall and two-story gate are the work of Heinouchi Masanobu, a master builder and official carpenter of the Edo shogunate. Getting there: Located 5 min. on foot from the Gongenmae bus stop. 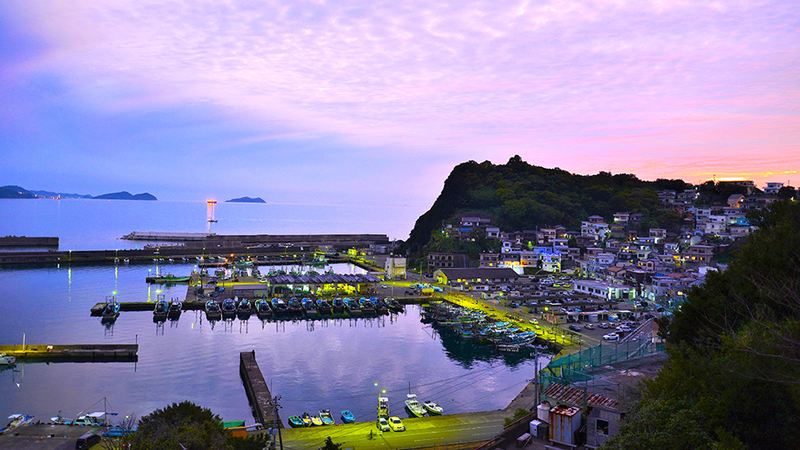 A Man’yo era poem described this fishing town on Cape Saikazaki as the “light of fishermen” in Saikaura. Dense outcroppings of houses on the cape’s cliffs evoke Italy’s Amalfi coast. Getting there: Located 9 min. on foot from the Saikazaki bus stop. Parking: Available in the surrounding area. After climbing 231 stone steps, you’ll be rewarded with a panoramic view of Wakaura Bay. The spot is also famous for its early-blossoming cherry trees in spring. 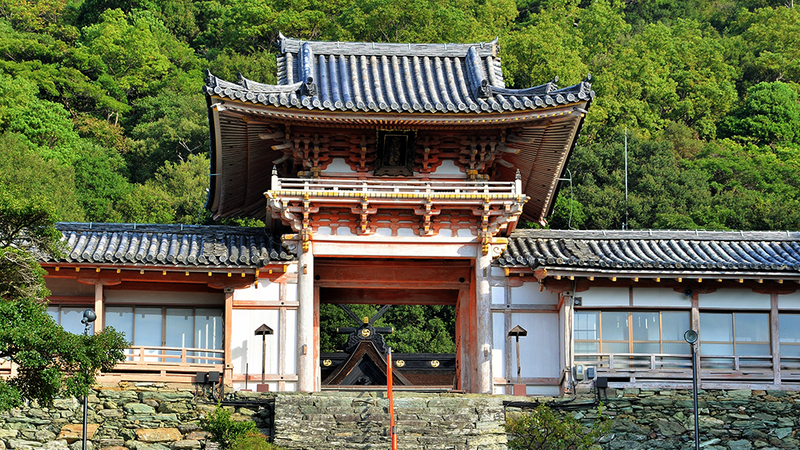 Kimii-dera Temple is the second stop on the Saigoku Kannon Pilgrimage’s 33 temples. Located halfway up Mt. Nagusa to the east of the Waka-gawa River’s tidal flats, the temple is famous for the views of Wakanoura from its grounds, which attract large numbers of pilgrims. Getting there: Located 10 min. on foot from JR Kimiidera Station. This garden, which was built by Chojiro Nitta, the founder of one of the world’s premier belt manufacturers, is open to the general public. The main house and other structures have been designated Important Cultural Properties. Getting there: Located in the immediate vicinity of the Kotonoura bus stop. Left: The shrine is considered one of the five highest-ranking subsidiary shrines that line the route. Right: The god Sarutahiko no Mikoto and a lion dance serenely in the Fujishiro lion dance. 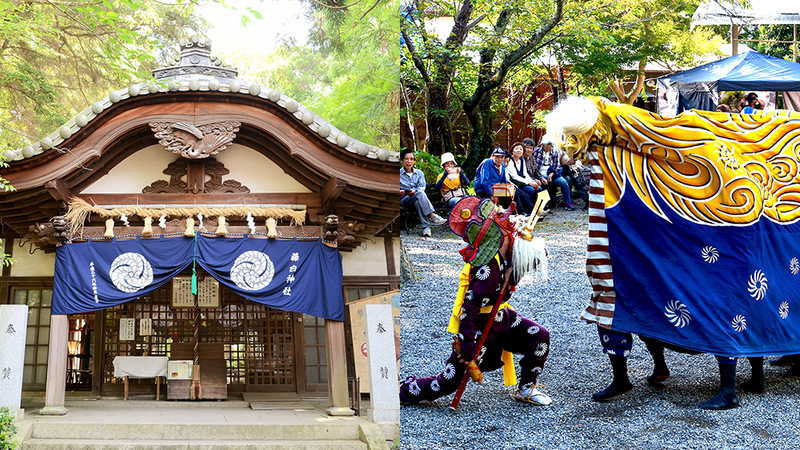 Fujishiro-jinja Shrine stands at the site of a subsidiary shrine where retired emperors and nobles on pilgrimages to Kumano held poetry parties and offered up sacred music and dance to the gods. An elegant lion dance whose roots are said to trace back to the music and dance offered by those pilgrims is still performed today. Getting there: Located 16 min. on foot from JR Kainan Station. A total of 17 Jizo statues, one placed every 109 meters, keep watch over pilgrims as they come and go to and from Fujishiro-zaka Slope. 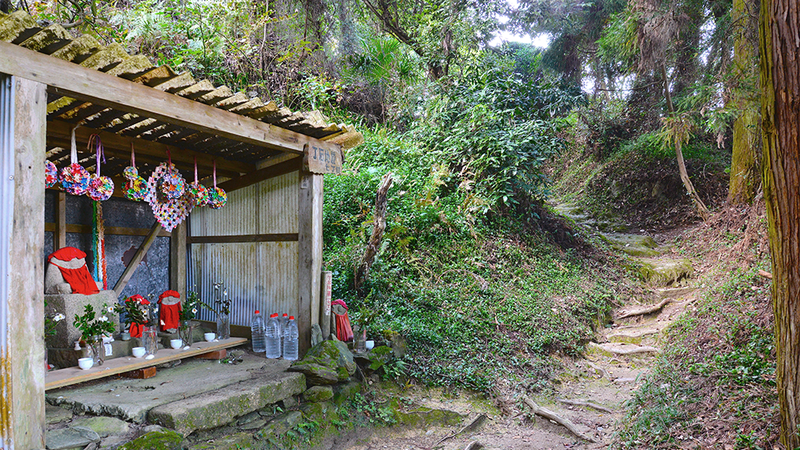 This segment of the Kumano Sankei-michi Pilgrimage Route extends from Fujishiro-jinja Shrine to the Fujishiro Toge-oji site. 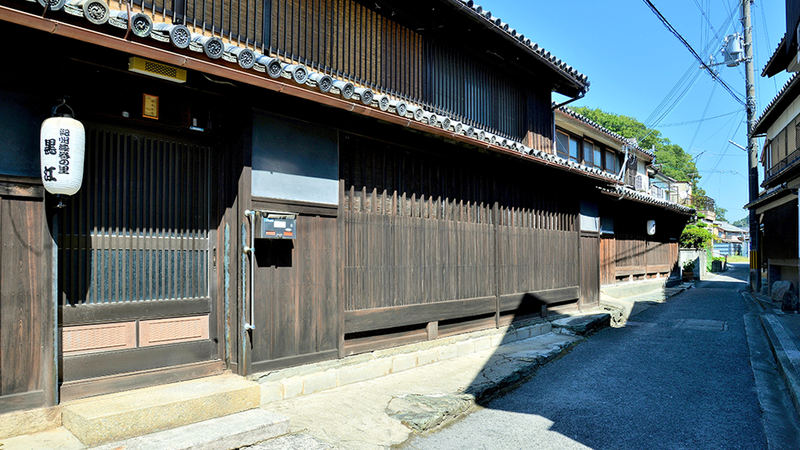 Legend holds that Prince Arima was arrested on suspicion of fomenting rebellion and strangled here in 658. The road is lined with Jizo statues that have been placed at a regular interval. Getting there: Located 20 to 30 min. on foot from JR Kainan Station. 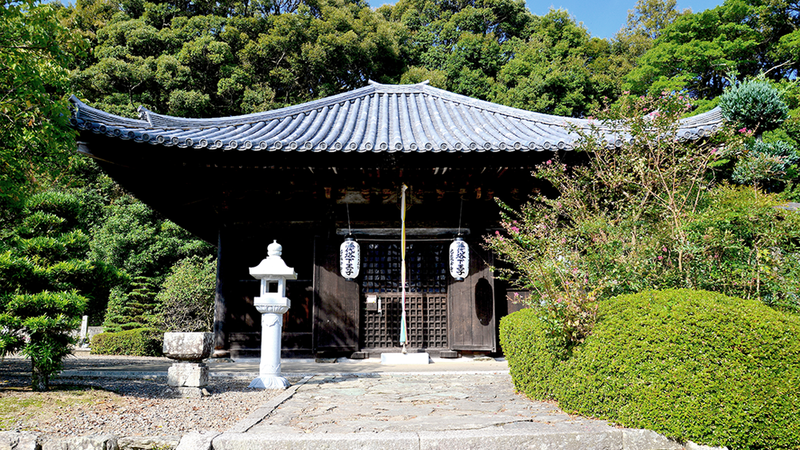 This temple stands at the former site of Toge Shrine, one of the 99 subsidiary shrines that line the Kumano Kodo Route. 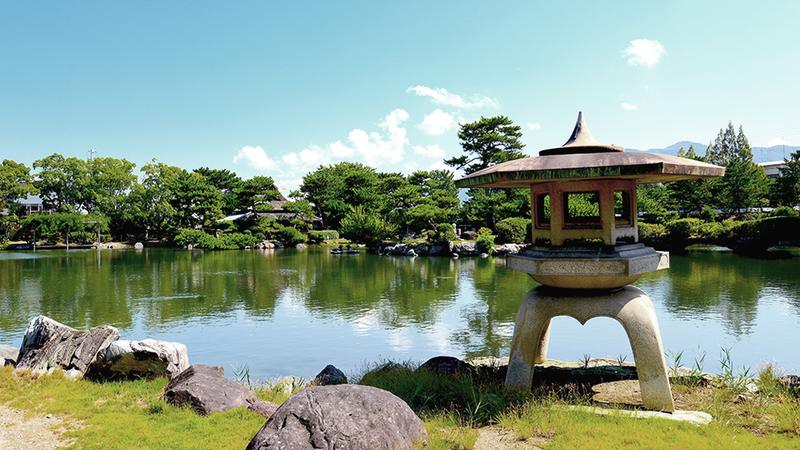 The lawn of the imperial palace located behind the temple was praised during the Edo period as an excellent vantage point from which to enjoy the scenic beauty of Wakanoura. Getting there: Located 1 hr. 50 min. on foot from JR Kainan Station. Enjoy diagonal rows of distinctive houses that line the street. This inlet, which is described in Man’yo era poetry as the “tidal flats of black cattle,” prospered during modern times as a town of lacquer craftsman. Rows of townhouses face the street at an angle, creating a distinctive, saw tooth-shaped townscape. Getting there: Located 5 min. on foot from the Kuroe bus stop. The remains of the Suiken sand dune, which comprises the site of a breakwater built during the second half of the Edo period, can be seen here. Part of the stone levee has been relocated to Suiken Park for preservation. Getting there: Located 10 min. on foot from the Yosuienmae bus stop. Cost, hours, and days closed: Admission to the park is free. 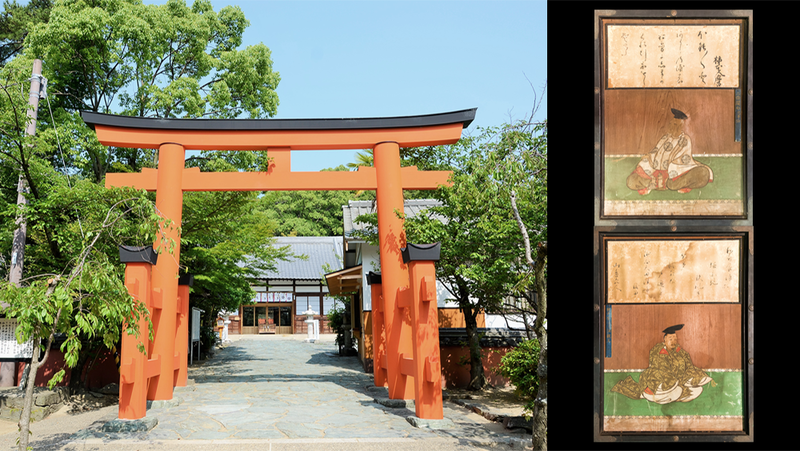 This shopping district is located along the pilgrimage route to Kishu Tosho-gu Shrine and Wakaura Tenman-gu Shrine. During the Edo period, the area bustled with wholesalers selling wares from cargo vessels, and the ambience of that time remains today. Getting there: Located in the immediate vicinity of the Gongenmae bus stop. 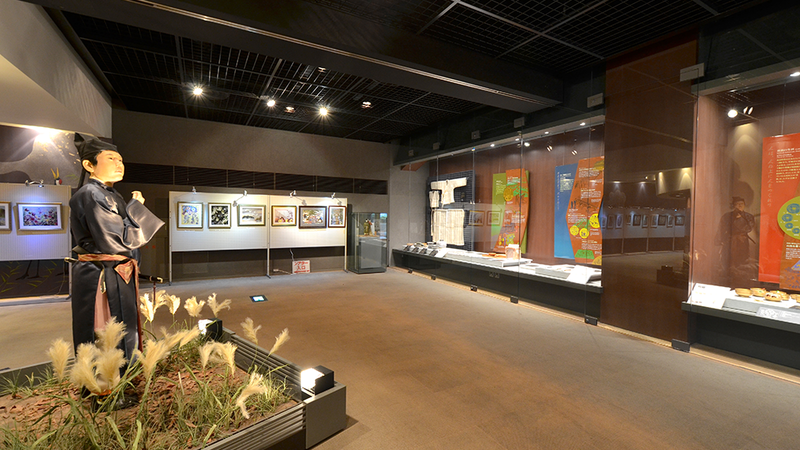 The museum includes an exhibit introducing the era of Tempyo culture associated with Emperor Shomu. Located in Kataonami Park, this museum introduces more than 100 Man’yo waka poems written in Wakanoura and Wakayama in an easy-to-understand manner through various exhibits, including a video theater. Getting there: Located 10 min. on foot from the Furobashi bus stop. Copyright c Wakayama Prefecture. All Rights Reserved.